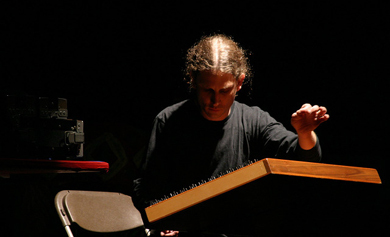 In his solo works for electroacoustic hammer dulcimer, for which he uses the title Dulcimer Flight, Dan constructs contemplative soundscapes that slowly unfold over the course of 30-minutes to one-hour. With roots in early minimalism, ambient music and acoustic ecology, these long-form “journeys” combine composed elements, often in the form of a fixed melodic pattern, with extensive improvisation while exploring the dulcimer’s rich harmonic properties. Using a mix of traditional and experimental (extended) techniques in combination with his self-designed laptop-based processing system, Dan gives this ancient instrument an entirely new and contemporary identity.